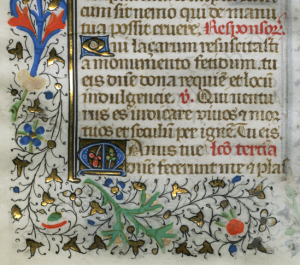 Our series of posts by Mildred Budny on Manuscript Studies continues with a somber view of a detached leaf from the Office of the Dead in a gracefully decorated Book of Hours from Flanders. With this post, given the subject of the manuscript text, we also reflect wistfully on the passing of some friends, colleagues, and others dear to us. The occasion prompts us to offer a personal recollection of Jennifer O’Reilly (1943–2016). Manifestly the text on this detached leaf demonstrates that it forms part of the Office of the Dead. 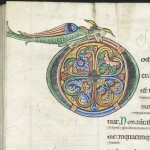 On its own, it is not exactly clear for which part of that Office this part of the text was intended to serve, mainly because there are no indications upon the leaf, and because the assigned practices for liturgical observance could vary considerably from place to place, custom to custom, and time to time. 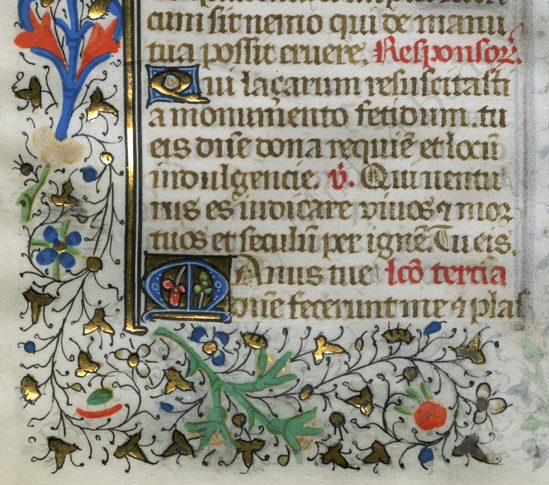 Such is the nature of Books of Hours, a widely popular and personal genre of manuscripts or printed books in the late Middle Ages and Renaissance. At least we know which part of that set of texts, that is, the Office of the Dead, to which this leaf pertained in its original setting, although we cannot be certain of its specifically intended purpose, that is, which part of that particular Office. 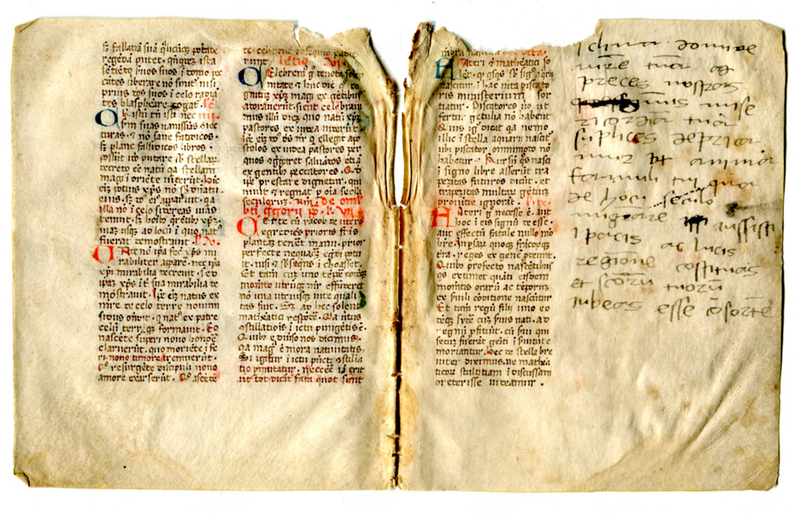 Discovery of other parts of the original book might reveal such features more precisely. Meanwhile, let us see what we can see. The Research Group on Manuscript Evidence, in keeping with the M-MLA conference’s theme of “Border States,” proposes the following pair of panels on materials in North American collections. 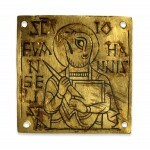 The panels invite all approaches, including textual, art historical, codicological, and paleographical. Interested panelists should send brief abstracts of no more than 300 words to jhastings@luc.edu by 5 April 2016. Soon we will post the programs for these panels, as the selection progresses. 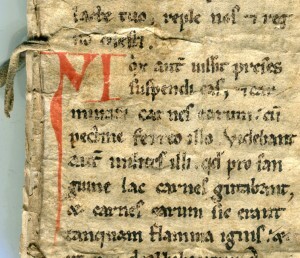 A manuscript fragment and its marginalia. Private collection, reproduced by permission. 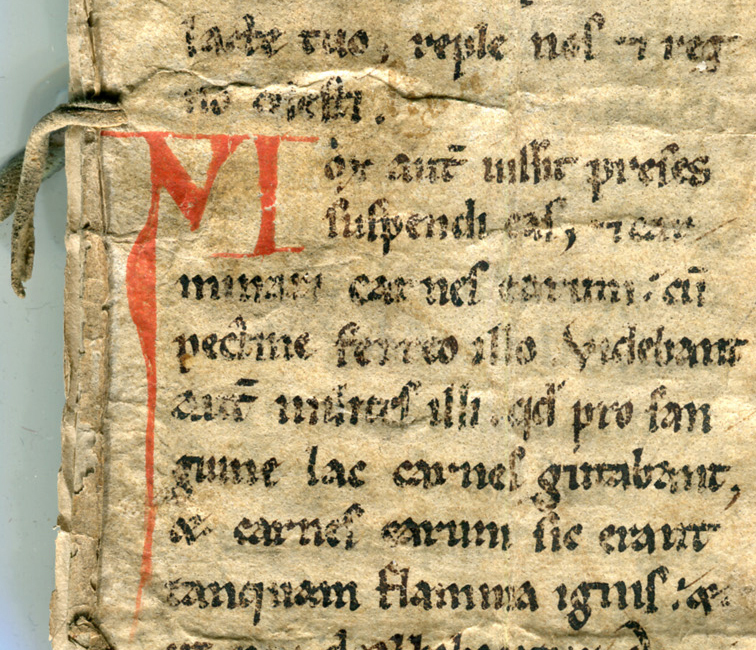 Information about this marginal entry and its manuscript context appears in Written In the Stars. Note. We met Justin through his participation in the Research Group’s co-sponsored Session on Medieval Manuscripts in North American Collections at the 48th International Congress on Medieval Studies. The Abstract for his Paper is published here: Hastings (2013 Congress). We thank him for his continuing contributions and his organizational expertise. 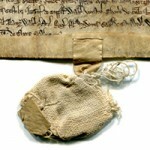 For information about the Events of the Research Group on Manuscript Evidence, to which these Sponsored Panels belong, please see our Events and Events Archive. For convenience, we maintain a distinction between our Events elsewhere (in various centers in North America and beyond) and our many Congress Activities over the years at the Annual International Congress on Medieval Studies, likewise with a Congress Archive, held at Western Michigan University each May in Kalamazoo. The pair of panels intended for the 2016 M-MLA Convention represent the first time, apart from the Kalamazoo Congress, that the Research Group sponsors meetings within a conference held in North America. We look forward to your contributions to this new stage in the history of the Research Group.